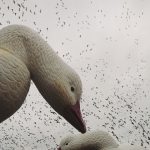 In the past five years we’ve duck and goose hunted all across the country. We’ve met some incredible people and made life long friends. Despite the outcome of each hunt, there has always been something to learn. None of our videos would be possible without you, the viewers, clicking the “play” button and for that we THANK YOU! It’s been an awesome ride, and we can’t wait to see what the next five years worth of duck and goose hunting will bring!